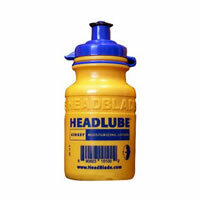 Like all HeadBlade products, HeadLube is specially formulated for your scalp! It won't clog your pores. It's free of perfumes and dyes (just like its buddy HeadSlick). And it also contains shea butter and tea tree oil. All the good stuff. The first two ingredients are water and safflower oil, so Glossy HeadLube will leave your head shiny but not greasy. HeadLube is available in both "Glossy" and "Matte."